Released last week, Avira's free Privacy Pal tool for Windows focuses on providing the user with a more precise level of control over the personal data collected and sent away by the web browsers and other apps. In addition to cookie, cache, or web history clearing, this app can also remove Skype chat logs or stop Cortana from tracking your location. In addition to its security-focused solutions, the popular anti-virus company Avira is also providing a few handy free tools that can be used as standalone apps. 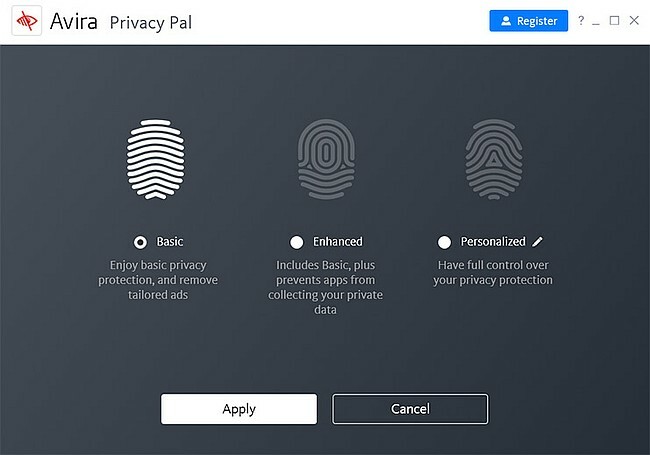 The pieces of code like Password Manager and Phantom VPN were recently joined by Privacy Pal, an app for Windows that aims to provide a "quick and easy fix for 200+ privacy issues" without giving headaches to anyone. All the nuts and bolts of the Avira Privacy Pal app can be accessed from the main window. This piece of code offers three presets: Basic, Enhanced, and Personalized. The first one provides basic privacy protection and removes tailored adds, while the second one also prevents apps from collecting private data. At last, the Personalized approach allows the user to adjust the settings as needed. Once the user gets deeper in the Personalized area, he/she can adjust multiple privacy settings. The list is quite long and includes the ability to block Microsoft Store apps to access the camera/microphone or wireless connections, block remote access, or even disable Cortana and the Microsoft Store. All in all, Privacy Pal is a quite handy tool that can be downloaded and used for free. A similar app that has absolutely no advertising included (Privacy Pal is not swarming with ads either, anyway) is O&O ShutUp. Is any of these two your favorite, or you'd like to adjust the settings by yourself the old way?